Myth busting - reasons to go solar today! There is a national shift happening in the energy market, and it’s happening at light-speed. The solar industry is booming and will continue to grow exponentially in the coming years. According to the International Renewable Energy Agency, solar power is set to grow six fold by 2030, as the cost of production falls below competing natural gas and coal-fired plants. The sun is quickly becoming our cheapest energy resource — going solar is now practical, accessible, and affordable for everyone. MYTH #1: Going solar is too expensive. Not anymore! The cost of solar panels has dropped dramatically over the last decade, and according to Consumer Reports has started to plateau, while tax incentives and state grants offer an extremely compelling set of discounts. Solar is an investment that will pay for itself, usually in less than 10 years, for both residential and commercial customers. And there are financing options available to fit everyone’s needs. Investing in a solar system is like buying your next 25 years of electricity upfront, but for a huge discount. If solar ownership isn’t feasible, the groundbreaking ‘pay-as-you-go’ community solar option allows everyone who pays an electricity bill to tap into solar power in their region, at 10% below market utility rates. Subscribers sign up for one year of clean, local, solar electricity and save money. Moral of the story: There are great, cost saving solar solutions for everyone. MYTH #2: There isn’t enough sun in New York State. While there is plenty of sun in New York, it’s no secret that often we see little sunshine in the winter months. Solar panels still work when it’s cloudy, although not as efficiently as on sunny days. However, thanks to New York’s net-metering laws, solar system owners are able to build up a bank of surplus electricity credits generated on long, sunny summer days, to offset their electricity usage on darker winter days. Solar systems are designed to easily meet up to 100% of their owner’s annual energy usage, providing reliable performance for decades. MYTH #3: My energy choices don’t matter. Yes, they do! When you choose solar energy sources you help to move New York State forward in its bold plan to reach 50% renewable electricity by 2030. This is one of the most progressive climate action plans of any state in the nation and we’re working hard to get there. The largest source of greenhouse gas emissions is from electricity generation. Switching to solar power creates a healthier environment by cutting carbon pollution, reducing water use, and improving air quality. A mid-sized solar system offsets over 350,000 lbs of carbon in its lifetime, equivalent to planting over 500 trees! Your decision to go solar can have huge environmental impacts! 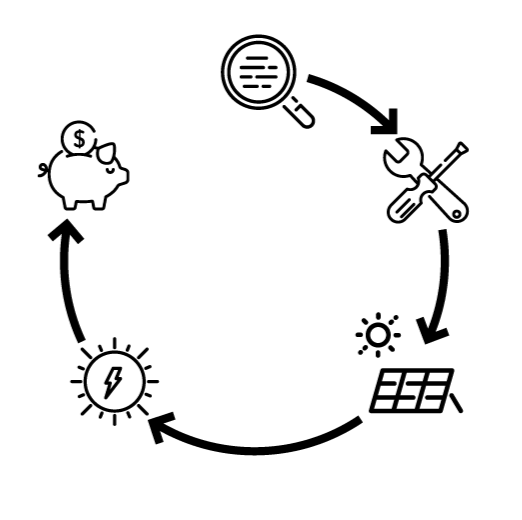 You can calculate the environmental impact of going solar today by visiting www.renovussharedsolar.com and entering information about your electricity usage.